These raised panel doors with narrow red stiles, upper glass panels, and broad rails create the solid, attractive entry. To the homeowner, the doors are mounted with contemporary hardware and deadbolt latches that provide confidence and stability in an easy-to-maintain portal. Raised panel doors lend a complexity to the design. The upper-panel lights (or glass treatments) add interest and curb appeal to the home. The ample kick panel provides additional protection against wear and the elements. 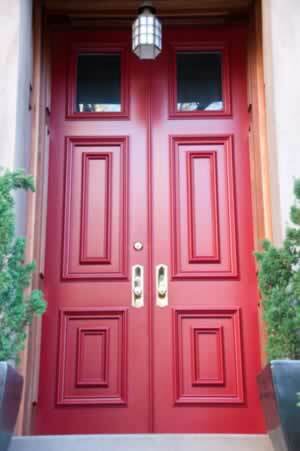 If you're looking for an attractive set piece that provides dramatic contrast to the building exterior, this red beauty makes for a perfect solution. New or replacement panel doors have greater rigidity than their forebears, and today's models can include insulation that curbs energy costs and reduces outdoor noise. Panel lights can include energy efficient coatings and insulation, too. Period lamps and greenery frame the entry, adding contrast to this stunning entryway.